Born: Marithé Bachellerie— Lyon, France, 1942; François Girbaud— Mazamet, France, 1945. Joint Career: Business formed in 1965; showed first collection, 1968, first boutique selling Girbaud-designed jeans opened, Paris, 1969; Halles Capone boutique opened in Paris, from 1972; first U.S. shop, Nantucket Island, Massachusetts, 1984; Jeaneration 21 line introduced, 1993; HiTech/HiTouch line developed, 1993; other lines included Complements for women, Closed for men, Reproductions for children, Complete Look accessories, Kelian-Girbaud shoes, Maillaparty, Compagnie des Montagnes et des Forêts, 11342, and Millesimes; launched promotional campaign for X-yoke shorts called the Cool Front featuring in-store refrigerator displays, 1996; moved men's jeanswear license from V.F. Corporation to I.C. 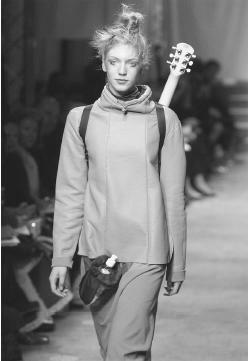 Marithé & François Girbaud, fall 2000 collection. Isaacs & Company, 1997; added women's jeanswear license to Isaacs line, 1998; introduced Freedom Jeans for women, a variant on cargo pants, 1998; introduced Denim Tool Belts, 1999; sponsored College Rock Tour 2001, a fashion show and concert series, 2001. Address: 8 rue Babylone, Paris 75007, France. La Ferla, Ruth, "François & Marithé Girbaud: Beyond Fashion," in the Daily News Record, 20 September 1982. Daria, Irene, "After the Switch: The Girbauds," in WWD, 21 December 1984. Walsleben, Elizabeth C., "The Girbauds' Design is in Their Jeans," in California Apparel News (Los Angeles), 11-17 July 1986. Daily News Record (New York), 11 February 1987. Bloomfield, Judy, "Girbaud: Keeping It Simple," in WWD, 3 February 1988. Martin, Richard, "Wordrobe: The Messages of Word and Image in Textile and Apparel Design of the 1980s," Textile and Text, 12 January-February 1989. ——, "The Eleventh Little Middle Ages: Signs and Chivalry in the Reconstitution of Medieval Dress in the 1980s," Textile and Text, 12 March 1990. Vasilopoulos, Vicki, "The World According to Marithé and François," in the Daily News Record 3 May 1993. Spevack, Rachel, "A Cold Front Moving In," in the Daily News Record, 8 April 1996. Socha, Miles, "Girbauds' Freedom," in WWD, 26 March 1998. Curan, Catherine, "I.C. Isaacs Hopes Girbaud License Can Stem Flow of Red Ink," in the Daily News Record, 7 December 1998. Socha, Miles, "Gladstone's Plan for a New Girbaud," in WWD, 4 February 1999. Malone, Scott, "Girbaud Jeans: On the Rise," in WWD, 3 February 2000. Cunningham, Thomas, "I.C. Isaacs Breathes New Life into Girbaud," in the Daily News Record, 5 June 2000. Marithé and François Girbaud have created fashion that emanates from the street; reveling in design problems of cylinders, mutation, and reversibility; and bringing high-style aspirations to casual materials and effects. Their proclivity to oversizing seems akin to Japanese design and Middle Eastern and East Asian peasant garb, as their futurist vocabulary of tubes and metamorphosis can seem a highly conceptual eventuality worthy of Marinetti or Balla, but also functions as fluid streetwear. Their deconstructivist bent, exposing the elements of garment manufacture, parallels Karl Lagerfeld at Chanel, but their medium is a more accessible casual wear—almost hip-hop homeboy style in New York or the carefree flair of a weekend in Paris. In the casual jeans-based look the Girbauds have created and recreated, they have consistently been the most innovative, experimental, concept-driven designers. The Girbauds have, in fact, commanded the avant-garde position in casualwear, customarily characterized by stasis, in the manner of high-fashion designers such as Jean-Paul Gaultier or Issey Miyake, thriving on conceptual development and change yet never failing to represent the irrefutable leadership position in the field. Ruth La Ferla, of the Daily News Record, called François Girbaud "three parts fashion technician, one part theoretician," yet the Girbauds have also been savvy interpreters, bringing out Ninja-inspired pantaloons with ankle snaps, rugged survival wear, and sophisticated 1940s and 1950s revival-wear. Beginning in retailing, the Girbauds were as street smart as they were conceptually witty and ingenious. François Girbaud told Irene Daria of Women's Wear Daily, in December 1984, "We design from the streets. We start at the bottom and move up." Kaboul/Champs Elysées could be worn in the Middle East or in Paris in their amplitude, cargo pockets adding to the engorged size, with a rustic combination of buttons and drawstrings. For fall 1986, big dhoti trousers and exotic cumberbunds and kilto-pants with voluminous tops and tapered legs combined East and West, exercise and boudoir. Yet the virtuoso accomplishment of the Girbauds is their repertory of trouser options for men and women, international in possibilities and strikingly original and inventive in realization. The Girbauds have also been aware of the history of Western dress. In menswear, their high-waisted Hollywood style for fall 1987 evoked the glamor era of movies in the 1940s. Their interest has also been in materials, from quilting and fabric-backed leather to a soft, stone-washed denim. Another conceptual element of the Girbaud style is the didactic display of the garment's construction, one Momento Due jacket revealing its pattern components, other garments inscribed with all their wearing options. In addition to the language of clothing, the Girbauds have played with language itself, vocabulary, hieroglyphs, and alphabets appearing again and again in the collection. When interviewed, the designers like to suggest their work is a perfect synthesis of their childhood preoccupations, she with creating doll clothes, he with American pop culture, films, and military outfits. There is truth to this proposition, yet it also is unlikely that these two designers who began as retailers are only pursuing personal desires. The casual clothing they have created is imbued with heritage, even if this legacy is working clothing, brought to the present in technical and even futuristic ways. In the evident conceptualism of their clothing (and in their bridge lines), they have expanded the market of casual clothing beyond the young, so their clothes are as appropriate to the market for persons in their 30s and 40s as they are to the primary market for jeans of teens or in their 20s. The Girbauds face many competitors in stylish casual wear for the young; they command the market for an abiding casual style for an older market, which has been increasing. In a July 1986 article, the California Apparel News reported, "In an industry where fashion changes with each season, the Girbauds' clothes have kept the image of comfort while growing in style and versatility to become 'concept dressing'." Innovation has remained a keystone of the Girbauds' line each season. 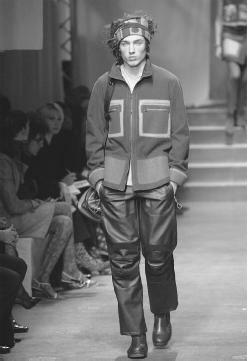 Their fall 2001 collection combined futuristic and prairie touches, which, according to Women's Wear Daily (WWD), unexpectedly worked well together. Although both WWD and the Daily News Record commented on the Girbauds' relative conservatism and simplicity in this collection, they noted the inclusion of items more typical of their work, such as down-filled shirts and navy boiled-wool jackets with exposed seams in orange. These nicely complemented the simpler direction in their jeanswear, critics said. François Girbaud expressed his frustration with the retro trends in jeanswear design at the turn of the century. He told WWD in a December 2000 interview, "I do not believe in that 1970s look. It is like opening up a book about the '70s and taking something from it— we already did that when we were there." Fabric innovation, of which the Girbauds were always proponents, has continued with projects such as Blue Eternal, a treated denim that holds its color after multiple trips to the laundry, as well as the development of a detergent to revive denim. In their designs, the Girbauds have often used synthetic fibers to emulate natural fibers— sometimes in combination with actual natural fibers—resulting in more flexibility of design. Synthetics, for example, can be fused or heated and not just saddle-stitched. In the late 1990s and early 2000s, the Girbauds' designs were emblematic of "utilitarian chic." Shirts and jeans featured many pockets and were made of wrinkle-resistant fabrics or were permanently wrinkled. An example of the latter was a vest twisted to look like a Sharpei's skin, as described by the Philippine publication Business World in November 2000. The Freedom cargo pant featured pockets for cell phones, personal digital assistants (PDAs), and pagers; an anorak had a front zipper allowing for a baby carrier; a utility bag with pockets was sold under the Denim Tool Belt brand. According to the Daily News Record in June 2000, one of the Girbauds' bestsellers is the shuttle, a carpenter pant with Velcro straps. Popular basic items include Brand X jeans with crisscross hip stitching and the Cowboy, which features a twist at the top of the front pocket, making it easier to insert and remove items. Complementing these basics are the Girbauds' newer, more experimental items, which include a stretch gabardine and nylon "climbing" pant with a belt buckle that the wearer can lock with a plastic key. Additionally, their European Sporcity brand serves as their couture sportwear line on the Continent. From a business point of view, the Girbaud jeanswear line has suffered ups and downs in the U.S. market. With its first licensee, V.F. Corporation, the Girbaud brand reached an estimated $250 million in annual volume in 1992, but after a too-quick expansion and overexposure, sales fell to less than a tenth of its previous high. In 1997 the men's license was transferred to a new manufacturer, I.C. Isaacs & Company, which added the women's license a year later. Isaacs struggled financially in the late 1990s and early 2000s, leading it to shed some of its brands, but the Girbaud line has remained a bright spot. Women's clothing is seen as a business segment with significant growth potential in the U.S., where it accounts for between 15 percent and 20 percent of sales volume for the Girbaud lines, compared to about 70 percent in Europe. In general, Isaacs is working to limit distribution in order to prevent the too-fast growth that occurred in the early and mid-1990s. The Girbauds enjoy breaking away from what other designers are doing in an attempt to create, rather than follow, fashion trends. Their designs always emphasize utility but can be far out of the mainstream in terms of style. As François told Women's Wear Daily (14 December 2000), "Our work is sometimes a little crazy—sometimes we are on the bull's-eye of fashion and sometimes we are not." I think Girbaud should make a come back and introduce the original design jeans (without all those pockets and straps) to JimmyJazz.